Abusir is a 5th dynasty necropolis. 7 pyramids can be founds here. Not all 5th dynasty pyramids are at Abusir there are 2 at Sakkara (Unas and Userkaf) and 1 at south Sakkara (Djedkare-Isesi). Abusir is about half way between Giza and Sakkara. The quality of construction is much inferior to the 4th dynasty masterpieces. Perhaps signaling a decrease in royal power or maybe a less vibrant economy. The pyramids are smaller and built of low quality local limestone. 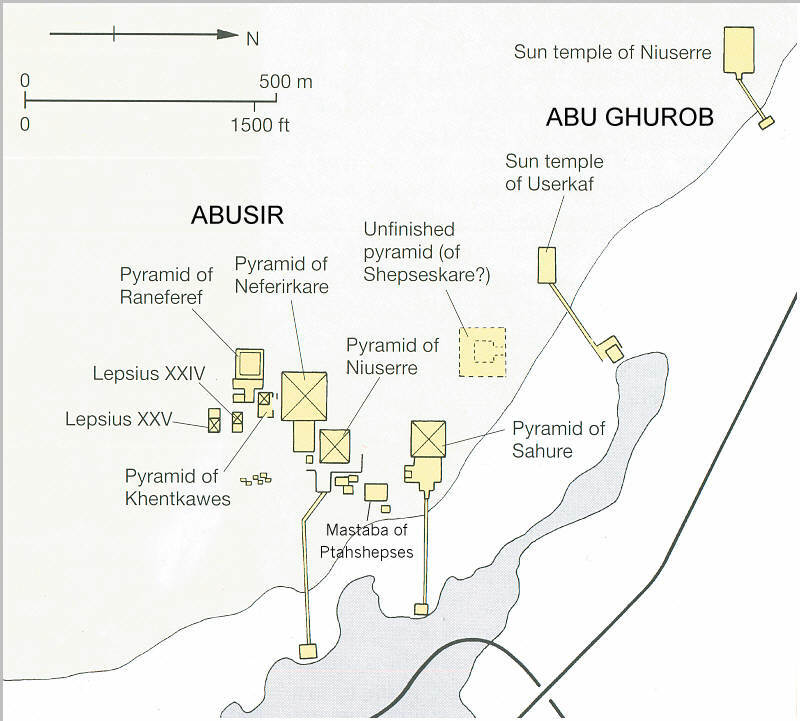 The visitor only sees 3 pyramids from a distance, that of Sahure (at the entrance to the site), the pyramid of Niuserre and the most intact the pyramid of Neferirkare. Borchardt found the famous Abusir papyruses in the Funerary temple of Neferirkare. These revealed an enormous amount of information of the 5th dynasty life and economy. There is even information indicating that astronomer-priest observed the stars every night from the temple rooftop. There is only one mastaba of significance here. That of Ptahshepses, a high level official during the reign of king Sahure.